Paul Evans crafts high quality men’s footwear handmade in Italy from the finest calfskin leather. With no middleman, Paul Evans ensures beautiful, timeless shoes are no longer monopolized by the traditional brands that charge thousands. Founded by a former banker in New York, Paul Evans is emblematic of the runaway success digitally native vertical brands can achieve when they both deeply understand their niche and can brilliantly execute go-to-market strategies. Paul Evans partnered with Okendo to give customers a platform to share their product experiences with other customers and shoppers in order to increase shopper confidence, facilitate decision making and ultimately, provide a better online shopping experience. Paul Evans shoes are made from the same ultra luxury materials used by the biggest luxury brands in the world. For shoppers new to the brand, that fact can sometimes initially be a little hard to appreciate. After all, as a digitally native brand focused almost exclusively on online sales, shoppers don’t have the option to first personally inspect the quality of a pair of Paul Evans shoes nor to try them on and find the perfect style and fit. To help new shoppers develop an immediate understanding of the quality of Paul Evans shoes and to make it easier for them to select the correct shoe size. 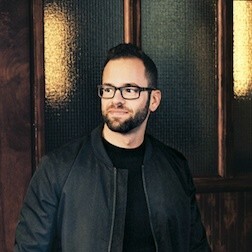 Founder & CEO, Evan Fript, chose to partner with Okendo to develop a on-site customer community that would include customer product ratings and reviews, detailed insights into product sizing and fit and hundreds of customer generated photos and videos of authentic product experiences. 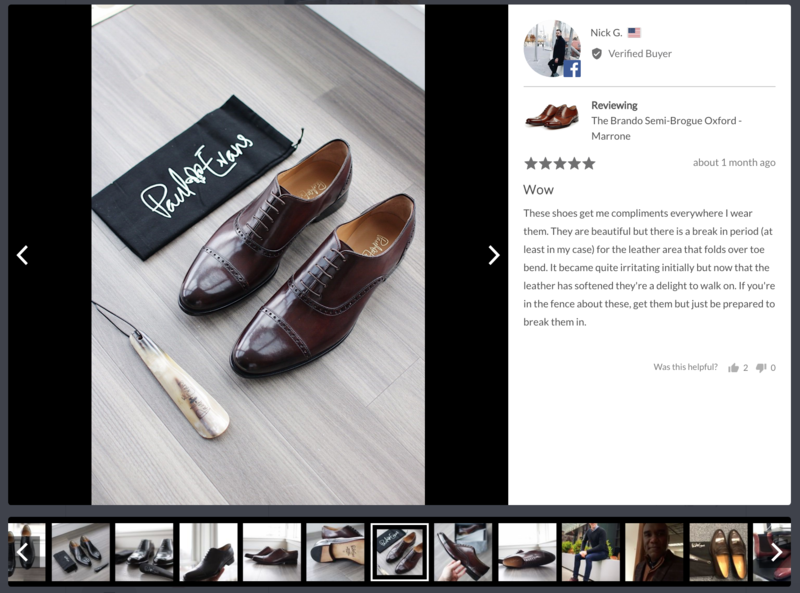 Upon arriving to the online store, an elegant carousel on the homepage would provide new shoppers an immediate insight into popularity of Paul Evans shoes and the level of satisfaction of past customers. The carousel shows the total amount reviews from past customers (now nearly 2000! ), the average star rating across all products and would also scroll through a live feed of the most recent customer reviews including both the product image and social media profile pictures of customers. 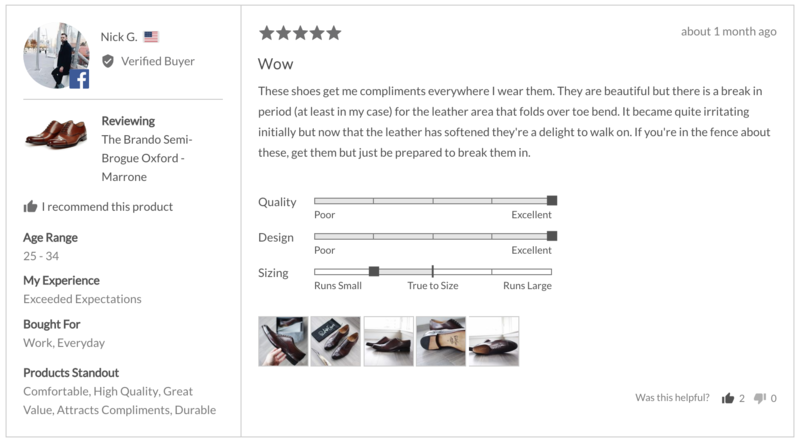 Shoppers would have the option to either click through to an individual product or to another page where they can read all reviews. When viewing individual product pages, shoppers would be able to see engaging, genuinely useful reviews that include star ratings, feedback from customers in their own words, as well as deep, structured insights into key product dimensions such as “Quality” and “Design. Included with each review would be customer insights into sizing such as whether the customer thought the product “Runs Small”, is “True to Size” or “Runs Large”, what size the customer purchased and how the fit was i.e “Perfect” or “A Little Big”. Shoppers could in turn use these insights to identify past customers with the same foot size as their own and to calibrate their size selection accordingly. Paul Evans shoes is an outstanding example of how digital, direct to consumer brands can leverage customer intimacy to strengthen brand loyalty, build a customer community and generate customer insight that is valuable for both shoppers and for calibrating internal initiatives such as marketing and product development. It’s these types of brand-customer initiatives and outcomes which give digitally native vertical brands like Paul Evans a competitive advantage over traditional big box retailers. Okendo is a unified platform with a suite of products for creating amazing online shopping experiences. Made with love in Sydney, Australia.